We use USDA certified organic Calendula Hydrosol in all of our facial toners: Immortelle Anti-Aging Facial Toner, Aloe & Rose Facial Toner , as well as USDA certified organic dried Calendula flowers in our The Butter Balm formulation for its amazing ability to heal chronically dry and cracked skin, eczema and psoriasis. Calendula is a potent and healing botanical for the skin. It affects blood flow to the skin cells, providing anti-oxidant protection that reduces the appearance of wrinkles and age spots, as well as healing chronic dermal inflammation. Carotenoids improve the skin's appearance. They are present in Calendula and are also naturally present in our skin. However, this presence diminishes with age. 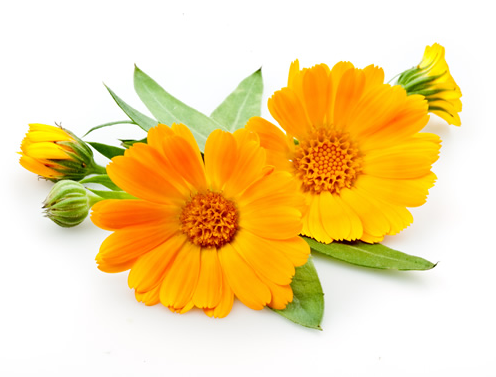 For this very reason, Calendula is wonderful for maintaining a youthful look for maturing skin.